Welcome to the Yakezie Blog Swap; A collaboration of bloggers who write on the same topic on the same day. Yakezie is a network of personal finance and lifestyle bloggers committed to helping others. Why not visit all the collaborators? “Guess what, guess what? I got my first order!” I excitedly squealed, shoving the phone in my husband’s face. It was my first sale on Fiverr. My job: post 10 comments on blogs in the purchaser’s niche, using the purchaser’s URL and email address to drive traffic to his or her site. I knew I would easily fulfill the order, get a positive review, and start making thousands of dollars online. No problem. Except, there was a problem. I was packing to leave on vacation with my family. I spent the morning getting everything together, and the afternoon on a 5 hour car ride. I couldn’t fulfill the order then, because I get extremely carsick when I read. I decided to wait until we got to the condo. Eventually, I got the job done, and I did get my positive review. But there are a few things I learned from this experience that are essential to being a successful entrepreneur. 1. While hoping for the best is a good starting place, you should always plan for the worst. When I said I could post 10 blog comments in 1 day, I didn’t realize that my order would come in at midnight on a day that I needed to drive 5 hours, pack, and fight with the internet. While promising a quick turnaround is good for business, you have to make sure you’ve given yourself enough time so that setbacks won’t ruin your success. I nearly had to talk myself out of a panic attack when I feared I wouldn’t complete the order. I had to remind myself that this $5 order ($4 really, after Fiverr takes its fee!) wasn’t worth ruining the start of my vacation for. What was the worst that could happen? I would kick off my Fiverr career with a negative rating. I wouldn’t make $4. This person would never order from me again. It’s a big internet out there. There are plenty of other sites to make money from, and an endless supply of potential new customers. This wasn’t going to ruin my freelancing career. 3. Your time is valuable. Charge appropriately. I didn’t account for how long this job would actually take me. If you factor in the headaches, the grumpiness my family had to deal with as I fought with my computer, and the high level of stress I encountered over that hour, it was a very difficult $4 to earn. While I think 50 cents per comment is a reasonable fee, I didn’t factor in research time. I changed up my strategy for the next time. I am still offering 10 comments, but I have promised them in 3 days instead of 1. I received an order yesterday, just as I was finishing up cleaning my office, my husband and I were about to have lunch, and then I had a Jack and Jill party to attend. I would have stressed myself trying to finish the comments that day, and probably missed lunch with my husband. The 3-day buffer helps me when unforeseen circumstances arise. Now, I have a regular customer. As a bonus, I’m more familiar with his niche; this cuts down on some searching time, as I already have websites in my arsenal I can bring up. While I’m not getting rich on Fiverr, it was a very valuable experience that taught me a lot about my ability to handle stress being realistic in my promises. Guest contributor Alexandra is the owner of Real Simple Finances, where she blogs about easy finance tips for real people. She can be found on Twitter at: @RSFAlexandra. Read about what others learned from their early employment! Have you ever freelanced? What were your experiences? I never freelanced, but this seems interesting. Frankly, my day job offers some extra money for very little effort. I can cover classes as a teacher and earn an hour’s pay. Huh, sounds like a nice (and hectic) experience 🙂 and the lessons just awesome. I’d also put my seal of approval on #2 from experience, don’t sweat the small stuff, as long as its not life-threatning, things will be okay. Secondly with side-gigs, a little confidence goes a long way. What a Fiverr adventure! Way to follow through and great lessons learned. I need to remember not to sweat the small stuff. Thanks for the reminder! I loved this guest article too and found the information so informative. I hope to hire some contractors from fiver. I was surprised that the contractor only receives $4. @Stefanie, So many of life’s lessons must be experienced, not read about! I guess thats where the old truism “live and learn” comes from. Fiverr freelancers offer some really great deals. You may find a questionable contractor there – just like anywhere else – but you can’t give up. Glad you got it working smoothly and you have a regular customer. Mike, thanks for sharing your experience. I personally use Fiverr a lot and have found many great freelancers there. Fiverr is the largest online marketplace, and it’s an easy way to making money. 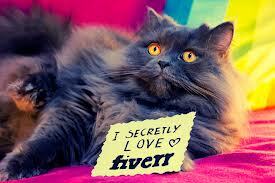 Fiverr provides an amazing service at $5 and it seems interesting. Thanks for sharing your experience. Amazing post. Thanks for sharing your experience. Dhruvaa and Tanisha, Thanks for stopping by. Glad you liked the article. Hey Barbara, thanks for the information. Just wondering if you have checked out Source Market? It’s a relatively new version of Fiverr used mainly for SEO gigs. It’s becoming very popular quite quickly. I would be interested to know your opinion. Have you heard of it?